These packages provide discounted and bundled advertising options for brands interested in reaching an audience of people highly motivated to find low-carb and sugar-free foods, diabetes health-related products, and diabetes-related services. If you are interested in a specific combination of ad products, or are currently running a campaign elsewhere that you would like to try with us, then please contact us. We will create a package for you based on your specific needs and budget. These packages are sold as an annual package with the cost budgeted over the entire year. 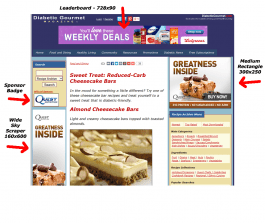 It is available for Diabetic Gourmet Magazine advertising. We may also be able to quicken the pacing to 3, 6 or 9 months if space allows. Mix and match for quantity discounts, as shown. The ultimate opportunity for premium brands to reach and engage a highly-targeted audience. Like to Get Started Right Away? Have Questions? If you have questions about advertising opportunities, please contact our friendly advertising coordinator using this contact form or use the contact information that follows.